The Radisson Resort Orlando Celebration has a quartet of places to have a meal, a snack or something cool and refreshing. 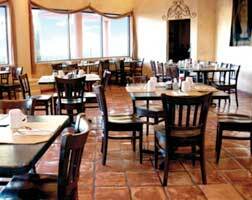 Mandolin’s is open for breakfast, lunch and dinner, serving hearty portions. The breakfast buffet boasts 40 different items, with the omelettes the undoubted star of the show. Later in the day, the cuisine is Mediterranean inspired. Sports fans will love the Sports Bar, with its huge 6 by 11 foot TV, and great drinks menu, with a full menu of food available. When it’s time to relax by the pool, head on over to the Cascades Pool Bar, which is well-known for its frozen Caribbean cocktails. A full food menu is available here too. Step back into the 1950s as you pick the tunes on the free jukebox in the hotel’s Diner. Start the day with freshly-baked Danish pastries and Starbucks coffee. There’s a full food menu for lunch and dinner, and Pizza Hut pizzas. Choose from speciality sandwiches, fresh salads, burgers, and old-fashioned desserts too. The good news for families is that kids under 10 eat for free at breakfast, when they’re with a paying adult diner. The mini market gives you the option of picking something up for a snack, or something more substantial.